SPS New England has successfully completed the replacement of bridges carrying Route 2 East and Westbound over I-95 in Lexington, also called the Concord Turnpike. Accelerated Bridge Construction (ABC) techniques were used to minimize disruption and reduce construction duration, including the first-time use in Massachusetts of precast, modular concrete abutments instead of a deep foundation system using numerous drilled shafts.Valued at $50 Million, the contract included: Resurfacing of approximately 6 miles of roadway on I-95 and Route 2; Improving alignment for Route 2 traffic; Extensive drainage improvements throughout project limits, and Increased vertical clearance for I-95 users. Multi-staged construction maintained existing traffic on Route 2 and I-95/Route 128. Route 2 is one of the main alternatives to the Massachusetts Turnpike for east-west travel and carries approximately 67,000 vehicles per day. The bridges, built in 1960, were structurally deficient and functionally obsolete, and the vertical clearance for I-95 under the bridges had been substandard. This project successfully addressed the bridges’ structural deficiencies, upgraded their capacity, meets current seismic criteria, improved safety, protects the environment and reduced annual maintenance costs. The project area extended from Old County Road in the west near the Lincoln town line to Spring Street in the east, near many high tech and biotech businesses. It also abutted the watershed of the Cambridge reservoir, the main water supply for the City of Cambridge. 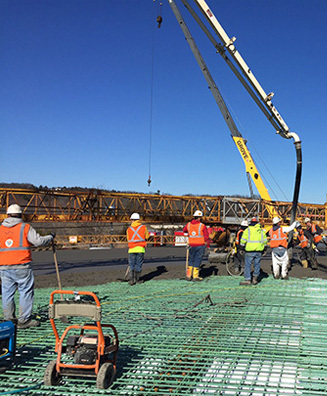 The replacement bridges consist of two 334-foot, two-span steel plate girder structures. The new bridge cross sections provide three 12-foot travel lanes, one 12-foot auxiliary lane and two 6-foot wide shoulders in each direction. The project also included upgraded stormwater drainage and treatment, and restored architectural and landscape elements to improve aesthetics. SPS and our Design Build Partners were proud to use innovative techniques to deliver this project safely and with the least possible amount of public impact.